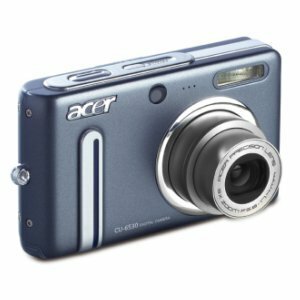 Acer CU-6530 digital camera features 6.36 megapixel resolution on 1/2.5 inches CCD, 3x optical zoom, wide zoom lens, 2.5″ preview LTPS LCD screen, video capturing at 30fps frame rate in 640 x 480 pixels resolution AVI (Motion JPEG) video format, Video Out (PAL/NTSC) port, maximum aperture at wide angle is F2.8 while at tele is F4.8 f-stop, lens focal length of 5.8 to 17.4mm, and connects to other devices via USB 2.0 port. Acer CU-6530 pocket size digital camera weighs just 125 gram and fits nicely into a pocket. ComputerAct!ve (link dead) reviews Acer CU-6530 and concludes with rating of 4 out of 5 that with the good points of 6.3 megapixel camera, 17 shooting modes and large 6.3cm screen, and bad points of control buttons can be fiddly and image noise with flash photography, this is a quality compact camera from an unusual source and at a good price.